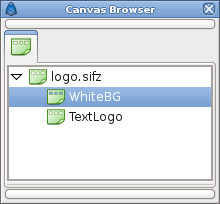 The canvas browser dialog shows the tree of canvases that are present in the currently selected document. Exporting a canvas parameter of a Group Layer will cause the canvas to be added to the canvas browser dialog. Double-clicking on a sub-canvas in the dialog will open a new work area window allowing you to work on the sub-canvas in isolation. This page was last modified on 22 June 2014, at 12:39.